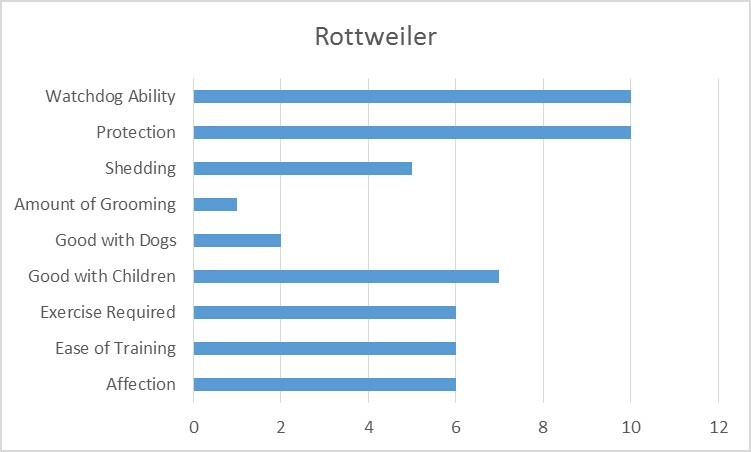 What Makes the Rottweiler so Popular? Could it be their good-natured, calm temperament? Could it be their ability to guard and protect? Once a Rottie owner, Always a Rottie owner? Known especially for their loyalty, Rotties are devout to their owners and will defend them with their lives. Their natural protective instinct proves correct to this day, so you are likely to see these dogs engaged in these same activities. They have gained fame especially among police, military, and transportation security. These hounds have an innate desire to please their owners. Dogs with this characteristic are easier obedience train, although, it is still recommended that they undergo formal training. Their eagerness to satisfy their owners makes them playful, yet sensitive to criticism and neglect. This breed, like all dogs, are born with a pack mentality that was crucial to their survival. They function best when their owner has assumed the role as pack leader. By assuming the role as pack leader, an owner commands the respect and attention of the dog. To properly train them, you need to be their pack leader. As previously stated, Rotties are often portrayed in a bad light, as aggressive, angry dogs. This is not true, yet it can be the case depending on the dog’s upbringing. They are really just perceptive of the emotions directed at them. Should they be abused, neglected, or otherwise ignored by their owner, they can become aggressive and dangerous on the whole. Rottweilers are known to pack a punch. They are famous for their exceptional strength. The extra muscle power they wield is particularly helpful while working as it makes them capable of herding animals of various sizes, even cows! The intimidation factor they bring to the table can frighten people, though, so it’s important to make sure they know the dog is not a threat. Working up an appetite wasn't much of an issue for Rotties, as they are often tired from a long day of work. Today, however, their desire for food can become a problem. People who own them solely as pets have to pay attention to their dog’s diet and exercise. Otherwise, they can become overweight, running the risk of overheating along with a myriad of other health problems. Children like dogs, but not all dogs like children. This breed can coexist with children just fine if they are raised or frequently exposed to them. If not, however, children can be at risk in the presence of an inexperienced dog. Small children are especially at risk because the strength of these dogs is enough to effortlessly knock kids down. These dogs need to be taught the proper behavior to have around people of all ages to coexist peacefully. Rotties, if not raised properly, will often fall into the “does not play well with others” category of dog breeds. Their defensive instinct makes them protective of their owners against any new animal or canine alike. This can be conditioned out of the dog with early exposure to other animals and dogs. They also respond well to being taken to obedience classes or dog schools. It is suspected that this dog breed has descended from an ancient mastiff breed known as Molossus. The Molossus was a large dog, well liked amongst the Romans for its ability to herd. Called Drovers, herding dogs were most important to the Romans. As the Roman Legions would travel, they kept their cattle close by which was an important food source for these warriors. In southern Germany, the town of Rote Wil sprung up, named after the red tiled roofs of the old Roman houses that once stood there. The breed was named after this German town. They soon gained popularity all throughout Germany in the early 200s AD. Fast forward a couple centuries, the Rottweiler had become a popular dog all throughout Europe because of its capability in a variety of jobs. They could be seen guarding herds all the way from the fields to the butcher’s knife. They also became famous for their ability to protect people as they were used to defend from robbers and attackers of all sorts. Once the demand for cattle drivers dropped with the advancement of technology, the breed faced an uncertain future. Their population decreased and there was less documentation of the dog in the late 1800s. They wouldn't receive much attention until the 1920s and after WWII. 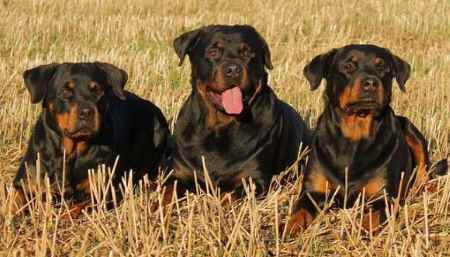 In the 1920s, multiple Rottweiler breed organizations sprouted up, yet few took hold substantially except for the ADRK (Allgemeiner Deutscher Rottweiler Klub), founded in 1921. At this time, the breed's vocational skills began to spread as they gained popularity as police dogs. While most dog breeds nearly went extinct during WWII, the Rottie prospered. Once the war was over its popularity boomed all around the world, known for its obedience and loyalty. However, with popularity came unscrupulous and improper breeding practices and poor ownership. The popularity of the breed would not see another spike until the 1990s. In the 90s upwards of a 100,000 Rottweilers were registered. This coincided with the beginning of the prejudice being held against Rottweilers for being aggressive dogs, as some the new owners were not fit to own them and raised them improperly. Today, these dogs are not utilized for herding as much as during ancient time. They do, however, do very well in flyball, agility, cart pulling, and herding trials. They are extremely useful in search and rescue and even used as a therapy dog. They was first registered by the AKC in 1931. Today, it is the tenth most popular dog breed in the U.S.
Black coats with rusty to brownish markings on their eyes, chest, legs, and muzzles. Rottweilers have a reputation for being difficult to train. 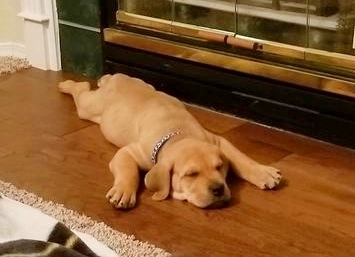 While their want to please their owners makes them eager to learn, they are stubborn if they do not have a strong disciplinarian figure for an owner. Achieving pack leader status is important for training, otherwise, they will walk all over you. While they are affectionate with their family and friends, it is quite the opposite towards strangers. This helps when they’re working as guard dogs, but when they are living the life of a family pet, this can be a problem. People and strange animals must be formally introduced and integrated into a Rottweiler’s exclusive trust circle. Being guard dogs, any new people, animals, or things will put a Rottie on alert. Early exposure is key to having a well behaved dog. By exposing them to different things early on in life, there is less of a risk of them acting in a hostile way when they encounter something usual. Raising Rottweilers in less populated areas is also ideal, as it gives them fewer things to watch out for. Typically, owners take them to obedience classes and puppy schools. Not only does this make training easier, but it is also a good way to expose them to other canines. Rottweilers are often most aggressive with other canines, especially of the same gender, so getting to know other dogs makes them less prone to this. When it comes to protecting yourself, your property, or your family, this dog breed is the name of the game. Protecting is what they do best, as they have been doing it for multiple centuries. They are not very vocal dogs, despite their guard instincts. They prefer to move patiently and quietly, sizing up a situation before doing anything else. While this is great if you or a neighbor are sensitive to volumes, it might not be ideal if you hoping for them to alert you to an intruder. Rotties will handle situations themselves, not often barking to call for help or alert. It is important to keep them from becoming overly protective. This is most likely how they gained their infamous personality as aggressive dogs, as unexposed Rottweilers will protect their owner from anything. It is important to teach the distinction between friend or foe. 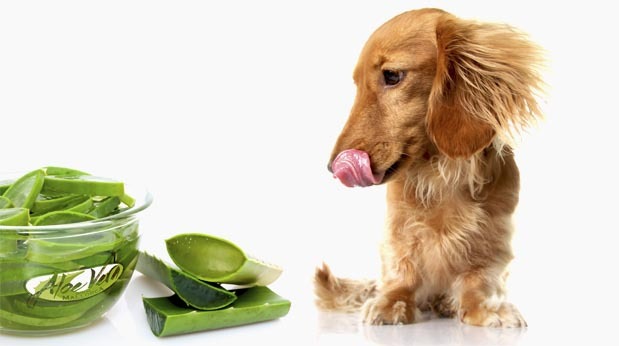 When it comes to grooming, this dog is easy to maintain! Their short double coat only requires brushing about once a week, and more often during times of seasonal shedding. Regular brushing will help remove shed hair, dirt, and other things that make be stuck in a Rottie’s coat. It’s not just their coats that need brushing. They also require regular brushing of their teeth. Brushing the teeth prevents bad breath, along with other dental problems. It is recommended that teeth be brushed at least two to three times a week. These are mostly clean dogs and don’t have a doggie odor, as some breeds do. Their short coats prevent dirt and odorous particles from sticking to them. This makes frequent bathing unnecessary. It is recommended that a Rottie is bathed at least once every other month, or as needed. It is also important to take care of a Rottweiler’s ears. Since their ears hang down, they are more prone to infection and getting dirty. Regular checking and cleaning the ears is necessary to promote good health with them. Dogs aren’t particularly known for their impeccable French manicures, but they do need their nails managed. It is important to clip a Rottweiler’s nails before they get too long because as with all dogs when their nails get too long, it can become uncomfortable and even painful. A good way to tell when a dog’s nails are too long is if you can hear their nails clicking against the ground when they move. All dogs are bound to have health complications, but some breeds are more prone to certain complications than others. It is important to be aware of the possible health complications when buying a dog. It is also important to supply decent health care to maintain the dog’s health. While it is not inevitable that this breed will be affected by any of these health complications, it is still important to take them into consideration. 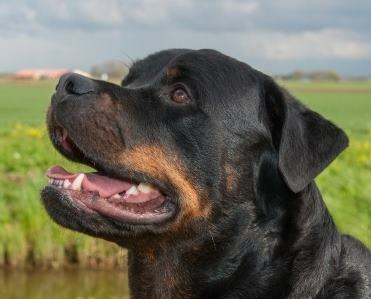 Purchasing a Rottweiler from a responsible breeder is also important, as buying from bad breeders may get you a dog with genetic health issues. Click on the links or images below for more information.